Trees are living things that live, get sick, and will eventually die; just like human beings. However, when a beloved tree begins to deteriorate, you shouldn't lose hope! Let us help you! 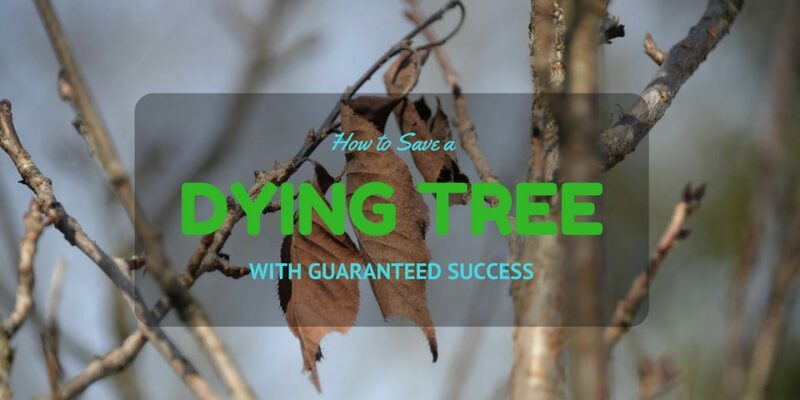 This article will guide you on how to save a dying tree. Trees add life as well as color to your garden. They do not only provide flowers, fruits, and shade but also serve as homes to beautiful birds and other animals. A healthy and beautiful tree can be a real prized ornament in your garden or backyard. However, this is just one side of the story! On the other hand, a sick and dying tree is something that you should be concerned about. Before you can embark on the quest to save a your tree, it is vital that you identify identify the signs of a dying tree. Consider as well, that not all people are able to differentiate a sick tree from a dead tree. It is often assumed that, in both cases, the tree will look lifeless, dried up, and without any traces of green foliage. So, before you go on and invest your time and resources in reviving a tree, it is important to determine whether you can still save the dying tree or it is already too late. Sparse to Absent Leaves. There is a difference between trees that lose leaves during autumn and trees that lose leaves because of sickness. Often, dying trees have less foliage than healthy trees. You'll find foliage on a couple of branches while most of the branches will be bare. Dried Up Wood. Extreme dryness of wood is another sign that a tree is dying. The branches of a dying tree often look lifeless, brittle, and can easily crack when you apply pressure. Unlike the branches of healthy trees, a dying tree's branches lack elasticity and do not bend. Signs of Decay. Signs of decay like the growth of mushrooms or fungi on the surface of the tree are a telltale sign that the tree is dying. Trees often decay from the center towards its outer surface. Cracks on Trunks. A dying tree often displays a vertical and continuous crack on their trunks. Inclined or Bent Structure. When a tree's health deteriorates, its roots will lose its strength. Thus, it will not be able to hold itself upright. Now that you are familiar with the common signs and symptoms of a dying a tree, what can you do to save the tree? It all starts with prevention. In fact, this is the key to saving any tree. First, you must avoid injuring the tree while doing any work in your yard. A wounded tree can easily catch an infection and other diseases. In fact, you might even consider getting tree trunk protectors. Here's a really good example of a tree trunk protector from Dimex. If however, you prefer a less solid trunk protector, this T﻿﻿﻿﻿ree Wrap from DeWitt may be better. You should also watch out for exposed roots as root rot is lethal to your tree’s health. You should always take care of your tree’s basic needs. If you mulch around the tree, you have to make sure to leave some room for it to breathe and absorb things. For the best mulching ideas, take a look at our article here. You should always be watchful of the weather. During summer months, your tree will need constant watering. You might even want to use a sprinkler system to make sure your trees are always healthy. Proper tree pruning is also essential. A pruned tree is a healthy and happy tree because it improves your tree’s immune system and enables proper growth. Since you already know the signs of a dying tree, the next thing that you need to determine is the exact cause of the problem. Consulting an arborist may be your best option. An arborist has the necessary training and knowledge to diagnose and treat any tree problem. At the first sign of tree sickness, consult an arborist right away. This way, you will have a good chance of saving your tree. Moisture issues are the most common cause of tree sickness. Both young and mature trees are affected by too much water or too little water. You have to check and make sure that the area where the tree is located has a good drainage. If you notice any water logging, you should provide better drainage. However, if too little water is provided to your tree, it can also affect your tree’s health. If the weather is dry, you should consider a regular schedule of watering your tree or perhaps set up an automatic watering system. Mulch is typically helpful for trees. Improperly used mulch, however, can still damage a tree. You should make sure that mulch placed around the base of your tree is not too thick. When placing mulch around the base of the tree you have to make it thin to allow the roots to breathe. Doing this will also prevent a host of other tree problems like bacteria and fungi infections, insect infestation, and rot. T﻿﻿﻿﻿﻿﻿his﻿﻿ artic﻿﻿﻿﻿le is a great guide on how much mulch to use. Improper use of fertilizers can definitely do more harm than good to your tree. When using a fertilizer around your yard, you should avoid sprinkling it too close to your tree. If you are using organic fertilizers, you have to make sure that the ingredients do not come from any diseased plant material. For fertilizer ideas, we'd recommend the H﻿u﻿﻿﻿﻿﻿﻿﻿mboldts Secret Golden Tree, Try it out and you'll find out why this tree and plant food carries the label, "World's Best Fertilizer." Before you go ahead and assume that your sick tree needs a fertilizer, it is best to test the soil to ensure that you are actually correcting the right problem. Knowing proper pruning techniques is also essential in saving a sick tree. It is also important to note that different tree varieties require different pruning techniques. Thus, you should take your time in doing some research. Proper pruning a sick tree entails removing any visibly diseased areas on an otherwise healthy tree. You should properly dispose of the diseased sections of the tree that you pruned to avoid the disease from spreading. For the best tree pruning practices, you'll need the right type of tree pruner. Unlike pruning shears, tree pruners are especially designed for thicker branches that are usually out of reach. A good example of a tree pruner is this 14-foot long extendable Tree Pruner from Fiskars. With this excellent tool, branches up to 1- 1/8 inch thick will be a breeze to prune. If, however, you prefer a powerful and automated tree pruner, then this Telescopic ﻿P﻿ole Saw from Sun Joe will be perfect. With a maximum reach of 15 feet and an 8-inch cutting bar and chain that can lop of branches up to 7.5 inches thick, this pole saw from Sun Joe will chew through those dying or diseased branches. Now that you know all about identifying the signs of a sick tree and the ways on how to save it, you can now start saving your sick trees. If you get it right from the identification of a sick tree to the actual tree saving process, you can definitely save your sick or dying tree. Did you find this tutorial easy enough to follow? I hope this tutorial will prove to be helpful in your endeavor to save your sick tree. After all, a healthy and happy tree does not only add property and aesthetic value to your home, but it also offers protection against strong winds and the blazing sun.